Sound travels through water across vastly greater ranges than light, and many marine organisms have evolved to exploit this fact. For many marine mammals, hearing is the primary sense; they use sound not just for communication and social interactions, but also for navigation and feeding. Man-made noise in the world’s oceans is already a significant pollutant in some regions; it is affecting the behaviour and physiology of acoustically sensitive animals. Compared to other oceans of the world, arctic waters have been relatively free of anthropogenic underwater noise because for much of the year, extensive sea ice has restricted commercial access to the Arctic. In fact, at present, the dominant noise source in arctic waters is sea ice itself. However, as the Arctic is warming and sea ice is declining markedly, the arctic soundscape is changing. This is taking place partly through increased wind noise and new sounds emitted by temperate species moving northwards, but the greatest change in the future is expected to be increased noise from ships and from the host of industries that are already expressing interest in expanding into marine environments in the Arctic. Due to the importance of sound to marine life, acoustic characterisation and monitoring of marine environments is becoming a major focus for researchers and environmental managers. Considerable evidence suggests that arctic cetaceans (narwhals, bowhead and white whales) may be especially sensitive to the impacts of anthropogenic noise. Bowhead whales communicate with each other over vast distances using sound. Narwhals and white whales use echolocation signals to find their food as well as using other sounds for coordination and communication within their tightly knit social groups. Our research project (Arctic Cetaceans and Ocean Noise – ACON) in the FRAM Centre’s MIKON programme, is using passive acoustic monitoring (PAM) technology to characterise the soundscape of the Norwegian Arctic and explore the potential impacts of anthropogenic noise on these vulnerable High Arctic species. In general, PAM technology utilises autonomous hydrophone (underwater microphones) recorders that can be deployed on a wide array of platforms (e.g. towed arrays, ocean gliders and moorings). In our case, the underwater sound recorders are attached to oceanographic moorings that sample a variety of oceanographic properties of the water column. Our AURAL (Autonomous Underwater Recorded for Acoustic Listening) recorders detect acoustic signals (both natural and man-made) throughout the year and provide long-term information about the underwater world of the Arctic. Currently, we have four recorders situated in both offshore and inshore environments in the northern Barents Sea region. One of our recorders has been situated in Fram Strait, between Greenland and Svalbard, since 2008. This area has proven to be a core-use area for the Critically Endangered Spitsbergen bowhead whale population during their winter breeding period. Bowhead whales are extremely vocally active year-round and, particularly during the breeding season, they sing very complex songs. Given the projected increase in anthropogenic activity in the northern Barents Region, the importance of Fram Strait area for Spitsbergen’s bowhead whales, and the sensitivity of this species to human-generated underwater noises, we decided to explore the soundscape of Fram Strait to determine the overlap of bowhead whales and human activity (e.g. seismic surveys and shipping). The soundscape of the region includes marine mammal sounds, seismic airgun signals and occasional shipping noise, in addition to sounds generated by natural physical processes such as movement of ice and wind. The mean noise level is currently low to moderate (<60 dB) compared to other ocean regions, but during the ice-free season, overall noise levels increase by up to 20 dB (roughly 4 times as loud) due to physical processes such as wind and current. Our recordings demonstrated the presence of bowhead whales from October to July with singing occurring almost constantly in the period November to March. This near-constant singing identifies the Fram Strait as a vitally important habitat for Spitsbergen bowhead whales. Acoustic signals from other marine mammals were also detected by the Fram Strait AURAL. Narwhal vocalisations and echolocation clicks were recorded almost year round, suggesting that the area is also important for this endemic arctic cetacean. During the spring-summer months, bearded seal vocalisations were detected, and blue whale calls were recorded over summer and autumn months. Interestingly, fin whale 20 Hz (low frequency) pulse calls were recorded from September to March. These calls likely originate from singing performed hundreds of kilometres away, but they are nonetheless a component of the soundscape in Fram Strait. Seismic airgun signals were detected throughout the year, peaking in the open water season in summer and autumn. Most of the signals were faint; they likely originate from distant seismic surveys (possibly >1000 kms away). 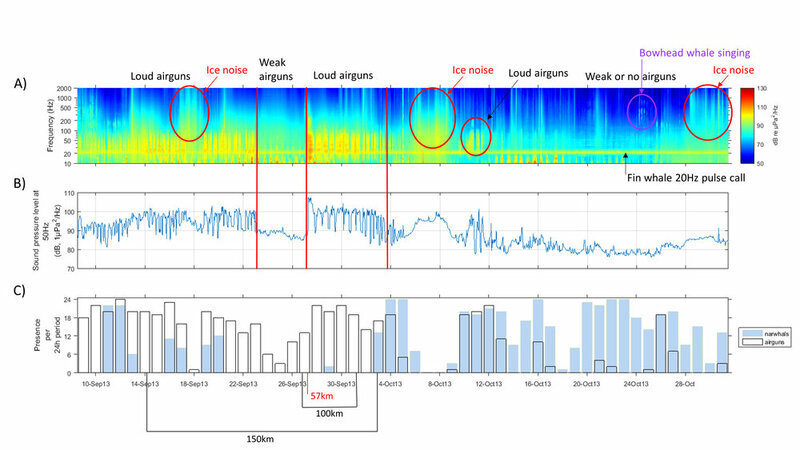 These distant signals do not significantly increase the observed noise levels in Fram Strait, but some very loud airgun signals were also recorded, that are derived from seismic survey vessels operating within 100 km of the recorder. These operations increased the noise levels eightfold. Although current human activity is relatively low in Fram Strait, there is some overlap between presence of arctic cetaceans and anthropogenic noise pollution. Climate change and concomitant reductions in sea ice are reducing the natural habitat of ice-dependent species and in the future are likely to expose them to increased anthropogenic noise pollution unless specific safeguards are set in place.